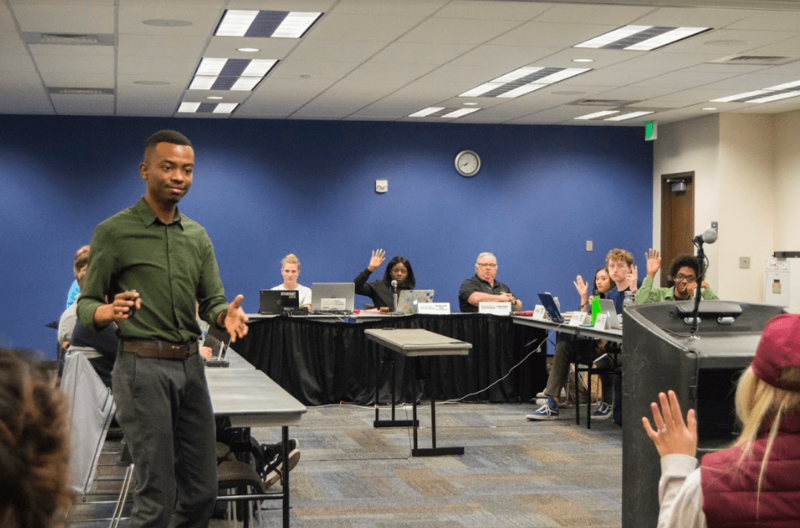 The Student Government Association (SGA) Senate heard an International Affairs presentation, the Fiscal Year 2020 SGA Recognition and Senate Bill 19 Pledge Funding at their April 4 meeting. They also voted on four Budget Advisory Committee (BAC) recommendations. Senator At Large Stephen Holmes presented the Fiscal Year 2020 SGA Recognition to the senate. The SGA Recognition is a stipend paid to members of SGA based on the hours their position requires according to the constitution and a base amount to account for parking. According to Holmes, recognition for the year 2020 could include a base amount of $250 per semester as provided by the Parking Pass. Through a formula that multiplied the Parking Pass amount by each member required office/outreach hours divided by two, Holmes determined the Fiscal Year 2020 Recognition amount to be $21,000. This year, the BAC is once again planning to budget for recognition of SGA members. Ryan Gorejena and Jacob Eavis gave a presentation on International Affairs. Their presentation included the top five countries student study abroad, when students can study abroad, study abroad costs and steps interested students can take to enroll in a program. Gorejena said that students most often choose the United Kingdom, Japan, Peru, France, or Germany as their desired study abroad locations. Students can study abroad for a short-term, the summer, one semester, or multiple academic years. Gorejena broke down the costs, stating that there are program or tuition costs, passport and visa fees, international health insurance cost, airfare, personal expenses and additional expenses associated with studying abroad. Students interested in studying abroad should first consider program options, visit an academic advisor, visit the education abroad team at the International Affairs Office, and then apply for a program. Students can also visit the International Affairs website at www.uccs.edu/educationabroad or email Gorejena (jeavis@ucc.edu) or international@uccs.edu if they have any questions. Pi Beta Phi requested $1,819 for conference and travel fees to send a freshman member along with two other delegates to a convention in Washington D.C. from June 28 – July 2. The purpose of the conference is to conduct formal business, celebrate and complete service projects with their fellow sorority sisters. Their request was approved 6-4, with Senators Grant Leson, Breana Arnold, Kassandra Pontilo and Brandon Goldstein voting against. The Tumbling Club requested $237 to cover costs to send three members to an acrobatic conference at Flipshack from April 18 – 21. The originally requested $158 for two members but was amended for a third person to go. The purpose of the members going to the event is to meet new people and learn new skills and instructional techniques. Their request was approved 10-0. Nature and Hiking Club requested a total of $2,582.88 to go on an excursion to neighboring national parks such as Yellowstone National Park and Grand Teton National Park. The purpose of them going on the trip is to get a better understanding of the Rocky Mountain region. Their request was approved 10-0. The Student Affairs Association requested $374.39 to cover costs of decorations and catering for their graduation celebration event on May 16 from 5:30-7:30 p.m., which expects 125 people to be in attendance. Their request was approved 9-0. Senator At Large Breana Arnold and Senator of the Arts Dan Boyd presented a proposal on the Senate Bill 19 Pledge Funding. They requested $2,666.66 to fund three events for inclusivity happening April 17 – 19. The requested funding will go towards securing the Ent Center Chapman Foundations Recital Hall, catering and 200 t-shirts. The main goal of upcoming inclusivity events is to create a more welcoming environment on campus. To help facilitate discussions surrounding inclusivity and to encourage inclusive behavior, the SGA will be holding a Student Panel on April 17, a Let’s Talk event on April 18 and Improv Night on April 19. Their request was approved 7-2 with Conor Price and Philip Oke-Thomas voting against the measure and Grant Nelson abstaining. To find out more the SGA, meetings or upcoming events, please visit their website at https://www.uccs.edu/sga/.